A+ Pets and Plants, LLC has been providing professional and reliable pet sitting and dog walking services to pet parents throughout the Central Savannah River Area since 2001. We are available 365 days a year for your furry friends; rain or shine. For our existing clients, we provide short-notice booking should you need us in a pinch. All Pet Sitters complete a thorough training program and we offer continued education opportunities. But, most importantly we love our jobs! Like many of us, Debbie is a pet owner and true animal lover. She always wondered why there were so few options when it came to reliable, quality pet care, especially since so many of us travel frequently and lead hectic lives. 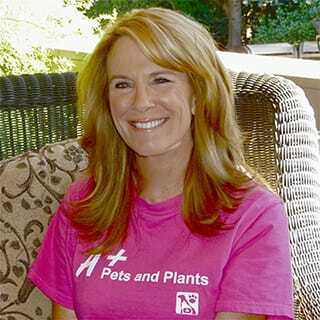 In 2001, Debbie left behind a successful 25-year career in auditing to found A+ Pets and Plants, LLC and pursue her true passion: putting a smile on the faces of pets (and their owners!). Debbie has successfully completed the Pet Sitters International Certification Program and continues her education in pet care. Fifteen years later, A+ Pets and Plants, LLC is proud to be considered one of Augusta's premier pet sitting companies, providing dependable and caring service to the greater Augusta Metropolitan area. Debbie’s personal pets include her Border Collie, Marley, Charlie (Lab/Pit) and 3 cats: Mary, Tiggy, and Oliver.